Although it's been a week heavy on Obamacare, we're going to (mostly) look forward this week, to the upcoming budget battles. Because buried in the Obamacare stories this week was one very important bit of news which few outside the Beltway even noticed. Which is a shame, because if used correctly it could signal a shift in the conversation in those budget meetings. To put this another way, while most focused on one broken promise from President Obama this week, he actually made good on an earlier promise -- which is nothing short of astounding and deserves a lot of attention. The promise Obama broke, obviously, was "if you like your health insurance plan, you can keep your health insurance plan." Thus the pitfalls of talking points -- when something complex is boiled down into a soundbite, sometimes important distinctions are not made. It's easy, on Monday morning, to quarterback this one into a much better promise Obama could have made: "if you like your quality health insurance plan, you can keep your quality health insurance plan." But, unfortunately, that's not what Obama said. Obama apologists are desperately trying to make the case for what Obama really meant when he uttered that statement (on multiple occasions), but this is a losing battle. The other side has two words, which is going to win the public debate on this one: "Obama lied." At the start of the talking points, we'll have one example of such an attempt, but you can see what a tough job it truly is by its very length. No, Team Obama's just got to take this hit. We've always known, after all, that pretty much any unbandaged scraped knee in the entire country was going to be laid at the feet of Obamacare once it got rolling, and truly this is just the beginning. Look for Republicans to dig out all sorts of anecdotes in the coming year, in fact. But at this point, Obamacare has to stand on its own. If the website gets fixed and if millions sign up, then eventually the public's going to get used to the program's existence, one way or another, and scare stories will lose a lot of their punch. No matter what your position on the federal budget or deficit, this is an accomplishment which cannot be ignored. It is going to lessen the "austerity" pressure from Republicans in the budget debates, if Democrats constantly and consistently point it out. Which brings us back to the committee. There will be 29 members of the committee, and the House Republicans truly got the short end of the stick. Here's the breakdown of members, by number: House Republicans (4 committee members), House Democrats (3), Senate Democrats (12), Senate Republicans (10). That's a 22-to-7 split favoring the Senate (where every single budget committee member made it onto the conference committee), where Republicans are more reasonable. And it's a 15-14 split favoring Democrats. This severely limits Paul Ryan's ability to hold hostages. Being Washington, however, the new conference committee met and then after a photo op or two adjourned for an entire month. I mean, it's not like they're faced with any sort of deadline or anything, right? Remember this when we do get close up against a deadline, because whiny politicians will then complain: "There's no time left! Waaah!" We'll be remembering, at that point, that the first thing the committee did was to take a month off. Which brings us to Congress in general, and the pathetic amount of "work" they do for their $174,000 taxpayer-funded salaries. John Boehner just released the House calendar for 2014. They've penciled in a whopping total of 113 working days. Down from 126 planned days in 2013, and an anemic 107 days in 2012. What this means is that in the next year, House members are going to work a grand total of 22.5 full work weeks, in a 52-week year. Which is pathetic, but the public just seems to accept this as somehow normal. Where is the outrage, folks? Dana Milbank at the Washington Post certainly seemed impressed by the performance of Kathleen Sebelius at her House committee hearing this week. But no matter how poised Sebelius remained -- in the face of repeated Wizard Of Oz references (Sebelius is from Kansas) -- she still won't impress us until she is testifying: "the website is fixed, it is fully functional, and it is signing up millions." She's going to have to wait for an award, in other words, until she can report something close to that. What did we do? We went back to our districts, and we told our seniors that although we voted no, we personally believe, and will work with the Bush administration, to make it work. That's what we did! And how many of you stood up to do that? None! Zero! Zero! When a Republican tried to peddle the nonsense that there was a Republican alternative to Obamacare, Pascrell responded: "Are you really serious?" It was a beautiful performance, in our opinion. It's mystifying why Democrats don't blatantly point out the missing context from Republican nonsense more often, in fact. It's not that tough to do. If political cartoonists (Jonathan Richards at the Huffington Post has a great example) can do so while making it simultaneously hilarious, then why do so many Democratic politicians lack this ability? If Republicans cry crocodile tears over people having problems with their insurance, it needs to be forcefully pointed out that the Republican plan for them all along has been: "You're screwed -- no insurance for you!" How Republicans have the gall to pretend to care about people for whom they would have done nothing is insane. They only get away with it because more Democrats don't react the way Pascrell just did. For showing the rest how to knock down hypocritical nonsense from Republicans, Representative Bill Pascrell is our Most Impressive Democrat Of The Week. Show them how it's done, Bill! We were reminded of this quote by the performance of Senator Dianne Feinstein this week. DiFi (as we like to call her) was miffed -- absolutely miffed -- that the National Security Agency was spying on leaders of our allies. She called for "a total review of all intelligence programs" in response. Except for the fact that she is the chair of the Senate intelligence committee and is therefore supposed to already know this stuff. It brings to mind the laughable statement from Arnold Schwarzenegger when he ran for governor of California, on the subject of his groping of women, when he swore that if he was elected, he would investigate himself. There's all sorts of appropriate metaphors to choose from (even O.J. and the "real killer"), but we've decided to run with Casablanca today. DiFi is shocked -- shocked, mind you -- that the N.S.A. has been overstepping any rational bounds of what it should be doing. And, furthermore, bugging Angela Merkel's telephone is somehow more shocking than the same thing happening to every constitutionally-protected American citizen. But the real reason DiFi wins this week's Most Disappointing Democrat Of The Week (her tenth, we should mention) is that in the very same week, she got a bill through her committee which would retroactively legalize all the spying the N.S.A. 's been doing, under the guise of "reforming" the N.S.A. 's mandate. So while she's shocked -- shocked! -- about the existence of gambling, she's pushing a bill which would make it legal to gamble, as long as everyone dresses as nice as James Bond (or something). To get all European here, there is only one possible response to DiFi: "It is to laugh, no?" Have fun with that total review of everything you're supposed to be doing, Senator Feinstein. Let us know how it all turns out, OK? Kind of a mixed bag of talking points this week. There's a few on Obamacare, but most are teeing up how to talk about the budget and the federal deficit. These are provided, as always, for Democrats everywhere to use with abandon, most especially those who are politicians being interviewed on television for the next week or so. Enjoy. Jared Bernstein certainly tried his best to spin Obama's "you will be able to keep it" statement this week. Bernstein is a former Obama administration economist, so he used to influence policy himself. But while his article is worth reading, his revised Obama talking point doesn't really work all that well. If you're one of the 95 percent of insured Americans with health coverage through your job or the government, then your plan won't change. If you're purchasing a plan in the individual market, and that plan remains unchanged, you'll also be able to keep it. But if you're [sic] non-group plan changes for the worse, it won't be offered once the new law kicks in. This has been a talking point for Democrats for a while, but now we've got numbers to back it up. And charts -- use the one earlier in this article, because it's pretty easy to understand graphically. "The federal government's budget deficit is half what it was a few years ago. President Obama has overseen the biggest drop in year-to-year budget deficits since World War II, in fact. 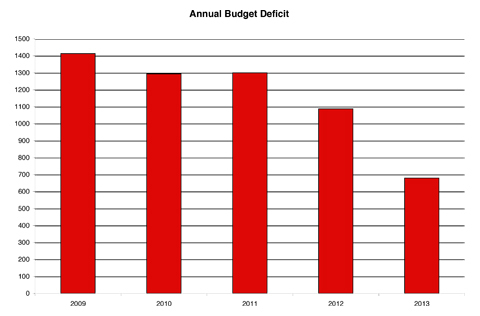 This is the fastest the deficit has come down since the end of the war, and I consider that quite an achievement." The breakdown figures are worth mentioning, as well. "The last fiscal year, the federal government ran a 680 billion dollar deficit, down from 1.4 trillion the year Obama took office. He has made good on his pledge to halve the deficit. But it's important to realize where the money came from. Spending went down last year 2.4 percent, but revenues jumped 13.3 percent at the same time. A big reason behind this is that the economy is getting better. We're growing our way out of the problem, although we're doing so slower than we would like. If Washington could manage to return to year-long budgets instead of bringing the country to the brink every few months, we could unleash even more growth. And for all the talk of how necessary spending cuts are, you can see how little an influence that had on the numbers compared to increased revenues and growth." This updates a talking point the Republicans have been using for years. The actual breakdown is about 19.7 percent. "When America was borrowing forty cents of every dollar we spent, Republicans screamed endlessly about the figure and called for austerity measures. Well, now that figure is less than twenty cents out of a dollar, because Barack Obama has made good on his promise to cut the deficit in half." Steve H. Hanke of Huffington Post does the math for us on this one. His article's well worth reading, but his talking point idea was too good not to use. "Looking for things to cut in the budget? Well, it's been reported that each and every American pays $574 per year (on average) to fund the secret agencies that are spying on us. Maybe the N.S.A. is branching out to data they should not be vacuuming up because they just have too darn much money. Maybe the way to rein them in is to trim their budget back a bit. That would surely help them focus a bit more on actual threats to the country rather than what Angela Merkel is going to have for lunch. All Americans should really be asking: do they really need all of that $574 I'm paying them every year?" One more news item flying under everyone's radar outside the Beltway. "Republicans are bizarrely trying to block President Obama from fulfilling his constitutional duties, because they don't like the fact that presidents get to appoint judges. They are terrified of losing their edge on the D.C. Circuit Court, the second-most-important court in the country. There are three vacancies. Republicans are blocking all three of Obama's nominees. In a fit of what can only be called 'reverse court packing' (or perhaps 'court unpacking'), they're trying to get rid of the three judgeships instead. They are the ones trying to cheat the system in the same way F.D.R. tried to cheat the system -- the only difference being that they're trying to subtract while F.D.R. tried to add. If this abuse goes on, Harry Reid should invoke the 'nuclear option' and end filibuster abuse for judges." Finally, we've got an argument for all the Republican doomsayers, from a Kaiser Family Foundation poll just out. "Even after two weeks of website problems, Americans are still in favor of keeping or expanding Obamacare versus either an unnamed 'Republican-sponsored alternative' or getting rid of Obamacare and replacing it with nothing. Keeping or expanding Obamacare polls at 47 percent, while full repeal gets 24 percent and the unnamed Republican plan only 13 percent. That's something to remember to put pretty much anything any Republican is now saying about it into perspective. And that poll was taken two weeks after the website rollout problems." And, furthermore, bugging Angela Merkel's telephone is somehow more shocking than the same thing happening to every constitutionally-protected American citizen. Perhaps bugging Angela Merkel's telephone wouldn't be somehow more shocking than the same thing happening to every constitutionally-protected American citizen ... IF the same thing was actually happening to every American citizen which, of course, is not nor will be the case... well, not without probable cause and a court warrant, anyway. Many people already mistakenly think that everyone's phone conversations are being listened to by the NSA. They don't need more fuel to add to that fire. I gotta give you credit, CW.. There is simply no denying that October was a train-wreck of a month for Obama and the Democrats. It IS well documented that ALL communications in the US are being monitored..
Obama said that if people like their health insurance, they can KEEP their health insurance. No amount of spin will change that one simple fact.. If Obama and the Democrats had even the SLIGHTEST sliver, the minutest speck of honor in them, they would concede the point and take their lumps like adults.. But these are politicians we are talking about, so I don't hold out much hope for that. The people who deserve the TRUE scorn are those non politicians who perpetuate Obama's lie with more lies heaped on more lies..
That says it all... It even goes further and espouses that the MSM is turning against Obama and obamacare.. Given the problems with the Healthcare.gov website, I thought I'd toss in a bit of self-aggrandizing back-patting. In particular, smooth implementation of the ACA is probably the most important. If it rolls out rocky and more flawed than the actual legislation, then it won't be improved (or even last long). On the other hand, if it basically comes out smoothly, then it will be tweaked and improved. As for Dodd-Frank, ensuring that lobbyists don't control the rulemaking and making the law work for real people is tremendously important for the nation. Long term, I think these are his biggest second-term challenges. I feel prescient (hehe). Obviously the site's issues are causing all kinds of political problems that were preventable had the admin taken this seriously when they had time to actually have a positive affect rather than dealing with them in reaction mode. As for Dodd-Frank, how's that working for us, huh? We really are screwed, aren't we? You SHOULD feel that way because you were dead on ballz accurate.. Team Obama had THREE YEARS to prepare for 1 Oct.. Does healthcare.gov honestly and truly reflect THREE YEARS of sincere hard work?? I mean, it's not as if they were putting a man on mars.. Not being asked to cure cancer. Not wanting to build a time machine. The Obama Administration had THREE FRAKIN' YEARS to do what?? "I'de call that a big 'yes' "
Com'on, people. Concede the point and lets move on.. I'm going to have to call you on your own falsehood, here. Where do you get this figure? Cite? 95% of Americans will either not see one tiny difference in their health plans, or will be offered plans they've never had access to before, which they are eager to sign up with. Of the remaining 5% (that's "one person in twenty"), about half of those will have to shop around for new plans. So for something like 97% of Americans, Obama was right. For the 3%, yes, well, Obama was not honest. But 3% is a whale of a lot different than your "upwards of 80%" -- so I throw the gauntlet down: prove your case. I bet you can't, because you are the one who is lying here. Sorry for being brutal, but it is what it is. 80% of Americans will not see ANY changes in their health plans whatsoever. Sorry for the facts, but they are what they are. And THAT is from one of Obama's main water carrier... You can bet that NBC would have grabbed onto the minutest iota of spin if it would save face for Obama.. It is well documented that upwards of 80% those who have insurance are totally screwed by obamacare.. I had great cancer doctors and health insurance.My plan was cancelled. Now I worry how long I'll live. But ya'all SHOULD be able to find one Happy American story for every 10 Scrooed American story..
Let's face the facts people..
Now, I don't care what your politics are.. The key words here, Michale, are those who buy their insurance individually . 50-75 percent of those who buy their insurance individually. Let's first find out what the percentage of people who buy their insurance individually is. Kaiser shows the data by state from the 2010-2011 census. It ranges anywhere from 2-9% by state. We'd be pretty safe in estimating the total for America somewhere between 2-9% - let's say 6%. Now, take 50-75% of 6%. This is 3% to 4.5%. Now out of that 3% to 4.5%, many will actually pay less AND have better coverage. This is where CW is getting an estimate of about 3%. Sorry, Michale. Even your statistics support CW's "Obama is 97% right" claim . BTW, are you sure NBC is a "liberal" media outlet? You keep making my case for me that there is no "liberal media," only corporate media. Aren't we talking about Americans?? Aren't we talking about Americans with Health Insurance?? So, what??? Because they don't get health insurance thru a narrowly defined Obama-parameter, they don't count?? It somehow CHANGES the fact that Obama lied?? My gods, the centrifugal force of this spin is horrendous! Why not simply say, "Sorry, Michale. We are talking about Americans who have one blue eye and one brown eye, so the percentage is a lot lower"
Obama said "If you like your health insurance, you can keep your health insurance"
Are you REALLY going to sit there and obfuscate the point because of a percentage!??? Would ya'all stoop to such F5 spin if a GOP POTUS had made such a blatant lie?? Of course you wouldn't... We KNOW that to be true.. Whether 5 Americans are affected or 5 million Americans are affected, that doesn't change the FACT that Obama lied. My point above is simple. We ARE talking about Americans with health insurance already..
And **OF THOSE** Americans, upwards of 80% are having their current health insurance cancelled. Now, ya'all can spin this and spin that and spin till the cows come home.. But you simply CANNOT spin the facts.. GODS, I wish we could have a NO SPIN zone here. Well then ... quit saying stuff like: "It is well documented that upwards of 80% of those who have insurance are totally screwed by obamacare." Because quite simply, it's not. Yeah, Obama likely shouldn't have made the blanket statement that he did. To be completely correct, he should have said "97% of people will be unaffected". Now, you can argue it's 60% instead of 70% or it's 20% instead of 50% but that's like arguing someone drowned in 80 feet of water instead of 20 feet of water.. The details, the exact numbers are superfluous to the main point. And that main point is that obamacare has caused MILLIONS of Americans to lose their health insurance..
obamacare has caused MILLIONS of Americans to have their health insurance cancelled. You can nitpick the numbers all you want.. But that simply doesn't change the basic facts..
Not according to the link you posted. The individual market, as mentioned above, is about 5% of the total health insurance market. You mean a web site with more back end code than windows 7 or OSX or the entire Office suite? Still just a website... Unless it is designed to teleport you to mars or send you forward/backward in time, it is still just a website..
"Hay! It just killed a civilian!!" "We project an 11% collateral damage rate. Acceptable..."
"Yea.. Unless you happen to be in that 11%"
The point, which ya'all just LOVE to ignore, is that there was supposed to be 0% who lost their health insurance. NO percent of Americans were to have their health insurance cancelled..
Do you want to address that??? Do you want to address that you lied earlier in the thread when you said upwards of 80% of Americans would lose their health insurance under obamacare? Ya know, I really have to give ya'all credit.. Ignoring Michale for a second, here's an excellent post on some of what's going on with the letters from insurance companies. It seems insurance companies are taking advantage of the hype and fear to try to sucker people. They're claiming that the government is forcing them to cancel policies when in fact many of the plans were grandfathered in. They're claiming that the government is forcing them to cancel policies when in fact many of the plans were grandfathered in. And then the Obama Administration tightened the rules..
Like I said.. All you have is Administration spin.. But these aren't other circumstances.. If it puts Obama in a bad light, it's all "hype and fear". No. If it's hype and fear, it's hype and fear. It's easy to acknowledge that there have been issues with the rollout. At the same time, it's quite clear that these are being hyped out of proportion for the same old, same old conservative political agenda of trying to get rid of the ACA (or anything government that conservatives don't like for that matter). Death panels!!!! Millions will die!!!! Everyone is SCREWED!!!! Does the script sound familiar? Actually a couple Michale's earlier links on this subject went into this fairly in depth, but they were from actual news outlets rather than the many opinion pieces and conservative blog posts he posted later that left those little details out. At the same time, it's quite clear that these are being hyped out of proportion for the same old, same old conservative political agenda of trying to get rid of the ACA (or anything government that conservatives don't like for that matter). "I had great cancer doctors and health insurance.My plan was cancelled. Now I worry how long I'll live." You want to tell Edie that her fear is "hyped"?? All I am saying is that millions of Americans ARE screwed..
Obama promised that NO ONE would lose their health insurance.. Here is the one fact that none of you can argue with..
Obama lied to sell obamacare to the American people.. It's all but assured that, if Obama was actually TRUTHFUL with the American people, obamacare would not be the train-wreck reality it is today.. Ya'all can equivocate, obfuscate and mis-direct all you want. Ya'all can sit there and exhort and extol the definition of "is" is until the cows come home.. But you simply cannot deny one simple fact. That is the beginning and end of my entire argument. Apparently, the media is slowly coming to the realization that obamacare *IS* a train wreck.. The Administration is melting down.. So let's look at that 3%. The reason they are getting letters about their insurance is that it no longer meets minimum standards for insurance. In other words, that 3% was paying for junk insurance. Yeah, they might have to pay a little more but they will actually have insurance coverage. As opposed to paying for junk insurance. Not that any of this will matter. Because you have an agenda. Again, you ignore the point to protect Obama. What part of "IT WAS SUPPOSED TO BE **ZERO** PERCENT" do you not understand?? Irrelevant. The people like it and Obama said they could keep it. THAT is the only fact that matters..
A LITTLE more???!!! Upwards of 400% more! You would rather protect Obama than admit that millions of American middle class got screwed.. These are the facts. Which ya'all time and time again refuse to address.. It causes people to do abhorrent things. Like defend a POTUS who blatantly lied just to further his political agenda.. The only difference is, my "agenda" is consistent with the facts and my principles.. Ya'all's agenda completely and utterly decimates ya'all's principles..
That's not what Obama is saying, David. NOW, Obama is claiming that, because the insurance companies changed the insurance AFTER obamacare was signed into law, THAT is why middle class Americans are having their plans they like cancelled and having to pay for exorbitantly higher plans.. So, you and Obama need to get your stories straight..
Further, the millions of middle class Americans who are being screwed don't have "junk" plans. They have plans that they like and that fit their needs..
Obama is making them pay exorbitantly high prices for crap they don't need..
For example. A family plan for a man and a woman in their mid 70s *MUST* include maternity care..
Get that?? This elderly couple MUST pay for maternity care in their plans. Now, YOU explain the logic of that to me..
You can't because there IS no logic behind it.. I think I have stuck with my bargain long enough.. I simply CANNOT, in good conscience, continue to call this train wreck by it's given name, obamacare.. It was possible to do so with a straight face when it was still (ever so slightly) possible that it might actually be a GOOD thing.. But, you know me.. I am the epitome of fairness..
Obama has claimed that obamacare will be fixed by Thanksgiving.. If obamacare is the same mess it is right now when the CW.COM Annual Fund Raiser kicks off, it will be forever known as "Obama's TrainWreck Care"..
Come on. It's not as if it's wrong..
You would rather protect Obama than admit that millions of American middle class got screwed. Nah. I just haven't seen any solid evidence from you making the case that people are getting "screwed". You just scream a lot and yell "Obama lied!" But you've been doing this since ... well, since the day he was elected. Ok, before he was elected. What we should really be wary of and what's being missed by the conservative propaganda attacks are any loopholes in the law which actually do allow corporations to take advantage of people. Here, I think there is work that may still need to be done. The funny thing (well, not really funny) is that these wave propaganda attacks may actually hide real issues with the law. Yea. It's ALL the insurance companies fault..
Nah. I just haven't seen any solid evidence from you making the case that people are getting "screwed". That's because you are ignoring everything, every FACT, that puts Obama in a bad light.. But you've been doing this since ... well, since the day he was elected. Ok, before he was elected. And there is ANOTHER BS statement.. I have all the facts on my side..
All you have is hysterical BS and spin. It's impossible to debate when ya'all are simply refusing to acknowledge reality..
Yea, no lying by Obama.. He is perfect. Never makes a mistake. It's always someone else's fault.. This time around, it's insurance companies' fault.. Benghazi, it was the military's fault. Illegal IRS targeting, it was some flunky's fault.. It's always someone else's fault..
You see, THAT is exactly the problem.. You ignore all the facts that show you (and Obama) are wrong.. If it's the former, that's just wrong..
You have been largely silent regarding the soon to be renamed :D obamacare.. Here's a point that is likely close to home for you. Seems to me that this type of down-sourcing was the EXACT same thing that the Obama Administration claimed is not really happening..
Of course, this puts them in the same group that OTHER Americans are part of.. Which brings up an interested question.. The Americans that Obama has executed without due process... Are they also "not scrooed"??? Have to ponder that one.. But anyways, what's your take on obamacare and how it's going to negatively impact the US's educational system?? Now Obama is lying about his lying!! "Now, if you have or had one of these plans before the Affordable Care Act came into law and you really liked that plan, what we said was you can keep it if it hasn't changed since the law passed." But compare THAT to what Obama is on record as saying on a DOZEN different occasions..
"That means that no matter how we reform health care, we will keep this promise to the American people: If you like your doctor, you will be able to keep your doctor, period. If you like your health-care plan, you'll be able to keep your health-care plan, period. No one will take it away, no matter what." Spin it all you want, people.. But Obama knew what he was saying was false. That is the binding definition of what a lie is. Does anyone else here believe Obama told the truth on 15 Jun 09??? Which just isn't true. 50 to 75% of 14 million? 14m is 4.2% of all "Americans." So, half to three-quarters of that is 2.1% to 3.3%. Which is EXACTLY what I just said, above. Three percent. Versus NINETY-SEVEN percent. Those are the facts, no matter how hard they are for you to accept. I took Michale's number, and the total population of the US (317m as of Jan 1, 2013) and divided. But we're both in the same ballpark, I see. Aren't numbers fun? You didn't say "this or that type of Americans" you said "Americans." You are the one who is demonstrably wrong -- by the article you yourself cited. Deal with it, pal. Yes, "Obama lied" -- I've admitted all along how damaging that is going to be to him. But for 97% of Americans, what Obama said is precisely correct. Millions will be affected. Hundreds of millions won't. Boy, you just keep digging yourself in deeper. This includes Americans who buy individual plans **AND** Americans who have plans thru their employer. 50 to 75 percent of the 14 million consumers who buy their insurance individually can expect to receive a “cancellation” letter or the equivalent over the next year because their existing policies don’t meet the standards mandated by the new health care law. Fact: 80% of Americans get insurance through their employers. That is FAR more than "14 million." Um, no. Go back and read your  comment. It was YOUR main point, and YOU are the one quibbling. Everyone else agrees on the math. Three percent is three percent, and no amount of spin will change that basic fact. Yes, "millions" are affected. And "hundreds of millions" are not. If you ignore the numbers, then you ignore the context. And, I remind you, you are the one who brought up numbers and percentages in the first place. Aha! Someone else who can deal with percentages! Whoa! An apology... wait a minute, you still haven't gotten it fully. It's the number with insurance who buy it on the individual marketplace. That's it. NOT the huge number who get it through their work. OK, I've said it all along, so in the spirit of your post , here goes: Obama lied. Happy? He lied to 3% of the people, and was accurate for 97%. Or didn't you have a Starfleet Academy name for it? It's been awhile. But I have to say that you are being fair by giving it until, let's say, December 1 before switching. Anyone else have an opinion? I think it's fair to release Michale from a promise he made a while back (SCOTUS ruling, I believe?) and let him call it TrainWreckCare or whatever. Anyone else? OK, whew! Made it through to the end. Here's something in general for you to ponder. If Obamacare needs fixing for 3% of the people, don't you think it would have been better if the GOP had agreed to minor fixes to the law to make it better rather than what they've been doing? 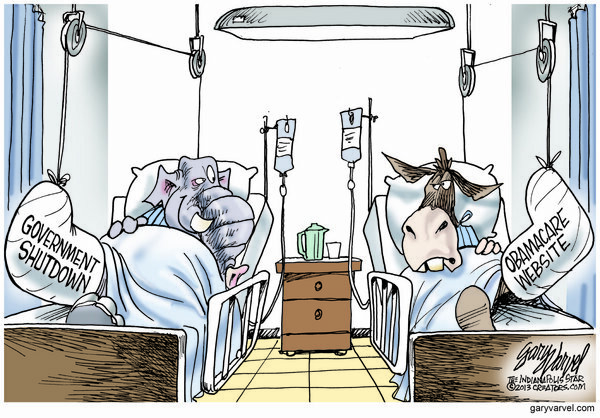 Problems are going to arise with Obamacare, pretty much every lefty agrees with that. But in normal times, problems are solved by Congress working to FIX the problems -- exactly what you call "putting country before party." If the GOP is so damn concerned about the 3%, then WHERE is their bill to fix that part of Obamacare? It doesn't exist, because the tears they are crying are crocodile tears. Democrats would certainly go along with any Republican in the House who approached them with "here's an idea to make Obamacare better by fixing this one flaw" -- but that has, quite simply, never happened. And, in fact, it cannot happen with the current House makeup. Which means that simple, minor fixes around the edges will never happen. How is that good for anyone? Here's an example of a simple fix that would have been welcomed by Dems in Congress rather that all the time wasted on "defund, repeal" -- "let's change the grandfather date to 2014, so that nobody's policy will be yanked away from them due to Obamacare." That's a commonsense answer to the entire problem you are upset over. And I'd bet dollars to donuts if 50 House Republicans cosponsored such a bill, it would SAIL through Congress. But that hasn't happened, because Republicans want to make political hay rather than actually address any problems. Does it matter WHO he lied to?? Or, more accurately, does it matter HOW many people he lied to?? Is lying somehow better if it's only to 10 people instead of a thousand people?? And would that kind of equivocation matter if it was a GOP POTUS who was "only lying to 3% of Americans"?? Obama lied. That is the beginning and the end of my point.. Here's an example of a simple fix that would have been welcomed by Dems in Congress rather that all the time wasted on "defund, repeal" -- "let's change the grandfather date to 2014, so that nobody's policy will be yanked away from them due to Obamacare." Democrats would NOT welcome that. They wouldn't agree to that whatsoever..
Because it would cut into the profits of their corporate cronies in the health insurance market..
Just like the Democrats would do if the situation were reversed. Right?? Politicians are putting Party before Country..
JUST like Democrats did with President Bush over his CT policies..
Republicans are acting like politicians..
JUST like Democrats did when the choose to shut down the country rather than delay obamacare..
A decision, I might add, that in hind sight was ridiculous because obamacare is going to have to be delayed anyways..
You are pissed at the GOP because they put Party before Country.. Yet, ya'all APPLAUD Democrats when they do the exact same thing..
Where's the logic in that?? Speaking of math ... 9 Michale comments in a row. Remember when Hannity decided he only needed himself?